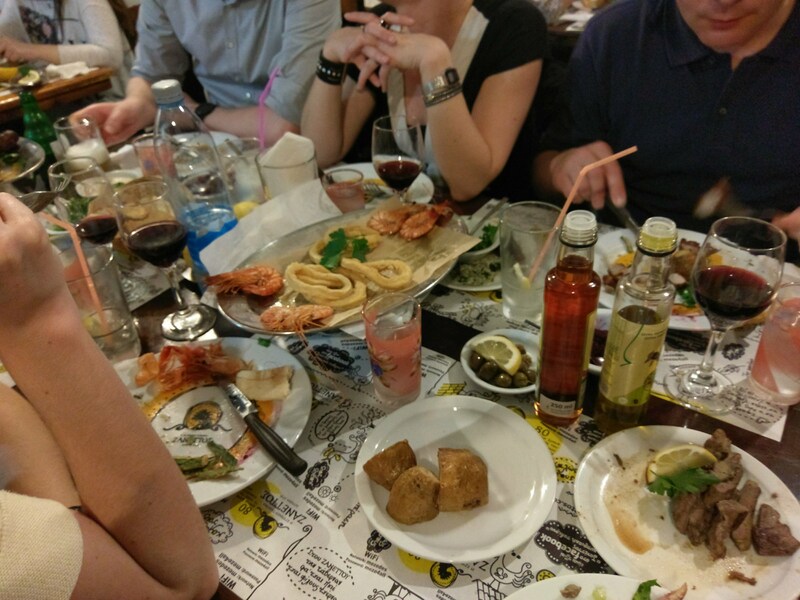 So I’m back from Cyprus, land of exceptionally large (and delicious) meals. And the mezze is probably a good metaphor for our ECPR workshop on active learning: lots of tasty and interesting things, but also a lot to digest. It’s fair to say that over the four days of discussion we made some progress, but also came to acknowledge that some substantial barriers stand in our way. So take this as a first cut (or a second one, if you’re going to be picky). As I noted in my previous post, our common goal for the workshop was to develop a better understanding of whether and how active learning works. Our papers – from colleagues across Europe – provided just the kind of starting point that we needed, from simulations to stimulate school pupils’ interest in university to students making their own videos. From that we’ve got three groups now working on pulling together symposia/special issues to showcase that evidence. Right now we’re pulling together some text to frame each of these, but we’ll be coming out to you – via this platform and at various L&T events in the coming months – to see if you have work that might fit in too. With that in mind, it’s useful to sketch out the three projects right now. The first is a collection of pieces trying to show the effects of active learning. Tying that together will be a piece that includes my own paper – on the range of possible effects – and another piece that sketches out a future agenda (of which more below). The second will consist of work that focuses more on methodologies for measuring learning effects. The workshop was very helpful for us to think about this aspect, not least because there is, once again, a huge range. The third will be of articles on EU-related topics, again talking about effects and approaches. This is a more functional product of our specific discussion, since it formed a convenient cluster. As I say, we’ll be coming back with more on these in the next period of time. But we also want to go beyond that. As a couple of the older hands noted, we’ve been here before: talking about the need for collaborations and bigger research projects to measure such things, then never quite getting there. Despite growing interest around the world, nothing’s quite taken off. “So why shouldn’t we try now?”, we asked. With that in mind, our ambition is to use the workshop and the outputs as a basis for securing some funding to set up a framework for capturing more systematic data on the benefits of active learning. This will have two main components. The main one will be to establish a grid for pulling together the very disparate research that exists and could exist, to allow for more comparative inferences to be drawn. It’s clear that trying to do it all ourselves – or even to create a project that does that – is probably beyond our grasp, so better to mark out some dimensions and benchmarks. And that leads to the second part: encouraging colleagues to add into that grid. One of the very nice things about pedagogic research is that people seem more willing to share data, and this grid – coupled to some kind of open database – would allow people to continue getting their work published, while also contributing to a bigger picture. Of course, none of this is going to be simple, and we are aware of “conference fever” (although this is much more modest than some of the ideas we came up with), but we think it has potential and is worth sharing, not least because the more we share it, then more chance we have of making it happen. It’s really early days on this, so if you have ideas and inputs, then we’re all ears: you might even get invited to our google doc (which’ll be another post). As the man in the mezze restaurant told us, as we rolled off our chairs: the trick is to take things slowly, rather than wolfing it all down. Good advice for this agenda too, I think.